This nylon fishing net won't degrade in this fur seal's lifetime. Nor will it degrade over the course of many creatures' lifetimes. When large nets are lost from boats or discarded into the sea, they float around until they are so full of dead animals that they sink to the bottom. After enough of the dead animals are removed from the nets by decomposition or by bottom feeders, the nets float back up and start the deadly cycle all over again. 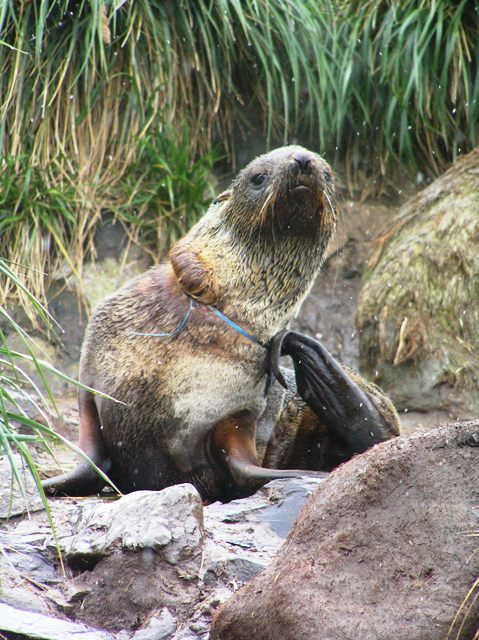 During a light snow, this juvenile fur seal tries to pull at the nylon netting that is choking it to death as it grows. It doesn't have much time left to live.